Shogi (shōgi 将棋) is one of a family of strategic board games of which chess and xiangqi are also members, which originated from the 6th century Indian game of chaturanga or a close relative thereof. Shogi is native to Japan, and is sometimes called Japanese chess. The objective is to capture your opponent�s king. Two players, Black and White (or Sente and Gote), play on a board composed of squares in a grid of 9 ranks (rows) by 9 files (columns). The squares are undifferentiated by marking or colour. 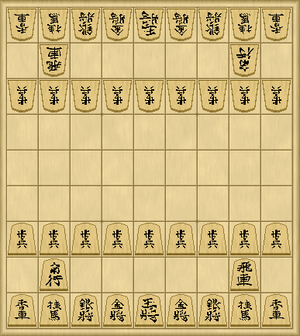 See shogi variants for other board sizes. Each player has a set of 20 pieces, listed below. Most of the English-language names are chosen to correspond to their rough equivalents in Western chess, not necessarily as translations of the Japanese names. Each piece has its name in the form of two Japanese characters marked on its face. On the reverse side of each piece (other than kings and gold generals) are one or two other characters, often in a different colour (e.g., red instead of black); this reverse side is used to indicate that the piece has been promoted during play. The pieces do not differ in colour, but instead each piece is shaped to show its direction, and this determines who controls the piece during play. Many people who are not familiar with Chinese characters have been deterred from learning shogi due to the perceived difficulty of learning the characters used on the pieces. This has lead to the development of "Westernized" (or "international") pieces, which replace the characters with more intuitive symbols, such as pictorial icons. But most players soon learn to recognize the Japanese pieces, so Westernized pieces have never become very popular. English speakers sometimes refer to promoted bishops and promoted rooks as horses and dragons, after their Japanese names, and often use the Japanese word tokin for promoted pawns. Silver generals and gold generals are commonly referred to simply as silvers and golds. Each side places all his pieces in the positions shown below, with their direction facing toward the opponent. The king is placed in the center file. The two gold generals are placed in the adjacent files to the king. The two silver generals are placed adjacent to each gold general. The two knights are placed adjacent to each silver general. The two lances are placed in the corners, adjacent to each knight. The bishop in the same file as the knight on the player�s left. The rook in the same file as the knight on the player�s right. In the third nearest rank, the nine pawns are placed one in each file. Traditionally, even the order of placing the pieces on the board is determined. There are two recognized orders: Ohashi and Ito. Shogi Pineapple indicates the order (page is in Japanese); Ohashi is depicted on the left and Ito on the right. The players alternate making a move, with Black moving first (the pieces are not differentiated by colour, so the only effect of choosing Black or White is to decide who plays first, and to differentiate the sides during discussion about the game.) A move consists of moving a piece on the board and optionally promoting the piece, or dropping a captured piece onto an empty square of the board. Each of these options is detailed below. Each piece moves in a distinct way. No piece except the knights may move over an intervening piece. If an opponent�s piece intervenes where a piece may move, the opponent�s piece may be captured by moving the piece to occupy the square where the opponent�s piece was and removing the opponent�s piece from the board. If a friendly piece (controlled by the same player) intervenes where a piece may move, the piece is limited to moves that stop short of the intervening piece (or no move at all in that direction if the intervening piece is adjacent). A king can move one square in any direction, forward, backward, horizontally, or any diagonal. A gold general can move one square in any of the following directions: forward, backward, horizontally, or diagonally forward (left or right). The piece does not move diagonally backward. A silver general can move one square in any of the following directions: forward, or any diagonal. A knight can move one square forward and one square diagonally left or right, in a single motion. It cannot move backward. The knight is the only piece that can ignore (jump) intervening pieces on the way to its destination, though its destination square must be either empty, or occupied by an opponent�s piece (in which case the opponent�s piece is captured). A lance can move any number of squares forward. It cannot move backward. A bishop can move any number of squares in any diagonal. A rook can move any number of squares forward, backward, or horizontally. A pawn can move one square forward. It cannot move backward. A player�s promotion zone consists of the three ranks furthest from the player. If a piece�s move begins or ends in the controlling player�s promotion zone, then that player may choose to promote the piece at the end of the turn. Promotion is indicated by turning the piece over after it moves, to show the character for the promoted piece. A king or a gold general cannot promote, nor can pieces which are already promoted. A silver general, knight, lance or pawn, when promoted, loses its normal movement and gains the movement of a gold general. A bishop or rook, when promoted, keeps its normal movement and gains the ability to move one square in any direction (like a king). If a pawn, knight or lance reaches the furthest rank, it must be promoted, since it would otherwise have no legal move on subsequent turns. For the same reason, a knight reaching the penultimate rank must be promoted. Captured pieces are retained and can be brought back into play under the capturing player�s control. On any move, instead of moving a piece on the board, a player can take a piece he has previously captured and place it on any empty square, facing the opponent. The piece now counts as any other piece controlled by that player. This is termed dropping the piece, or just a drop. Pieces that are dropped in the promotion zone cannot be promoted as a result. Promotion requires that piece making a normal movement on a subsequent turn, as detailed under "Promotion", above. A pawn, knight or lance may not be dropped on the furthest rank, since it would have no legal move on subsequent turns. Similarly, a knight may not be dropped on the penultimate rank. When a player makes a move such that the opponent�s king could be captured on the following move, the move is said to give check to the king; the king is said to be in check. If a player�s king is in check and no legal move by that player will get the king out of check, the checking move is also a mate, and effectively wins the game. A player is not allowed to give perpetual check. A player who captures the opponent�s king wins the game. In practice this rarely happens; a player will resign when loss is inevitable and the king will be taken on the opponent�s next move (as in International Chess) because of the tradition that it is seen as an embarrassment to lose. There are two other possible (but fairly uncommon) ways for a game to end: repetition (sennichite) and impasse (jishogi). If the same position occurs four times with the same player to play, then the game is no contest. (Recall, however, the prohibition against perpetual check.) For two positions to be considered the same, the pieces in hand must be the same, as well as the position on the board. The game reaches an impasse if both kings have advanced into their respective promotion zones and neither player can hope to mate the other or to gain any further material. If this happens then the winner is decided as follows: each rook or bishop scores 5 points for the owning player, and all other pieces (except kings) score 1 point each. Promotions are ignored for the purposes of scoring. A player scoring less than 24 points loses. If both players have at least 24 points, then the game is no contest. Games which are no contest are usually counted as draws in amateur tournaments, but in professional tournaments the rules typically require the game to be replayed with colours reversed (possibly with reduced time limits). Games between players of disparate strength are often played with handicaps. In a handicap game, one or more of White�s pieces is removed before the start of play, and White plays the first move of the game. Note that the pieces removed at the beginning play no further part in the game - they are not available for drops. Other handicaps are also occasionally used. The relationship between handicaps and differences in rank is not universally agreed upon; several different systems are in use. The method used in English-language texts to express shogi moves was established by George Hodges in 1976. It is derived from the algebraic notation used for chess, but differs in several respects. A typical example is P-8f. The first letter represents the piece moved: P = pawn, L = lance, N = knight, S = silver, G = gold, B = bishop, R = rook, K = king. Promoted pieces have a + added in front of the letter. e.g., +P for a tokin (promoted pawn). The designation of the piece is followed by a symbol indicating the type of move: - for an ordinary move, x for a capture, or * for a drop. Next is the designation for the square on which the piece lands. This consists of a number representing the file and a lowercase letter representing the rank, with 1a being the top right corner (as seen from Black�s point of view) and 9i being the bottom left corner. If a move entitles the player to promote the piece, then a + is added to the end to signify that the promotion was taken, or an = to indicate that it was declined. For example, Nx7c= indicates a knight capturing on 7c without promoting. For example, in the initial position Black has two golds which can be moved to the square 5h in front of the king, and these are distinguished as G6i-5h (moving the left one) and G4i-5h (moving the right one). In handicap games White plays first, so Black�s move 1 is replaced by an ellipsis. This article is based on the article shogi from the free encyclopaedia Wikipedia and stands under the GNU-Licence for free documentation. In the Wikipedia a list of the authors is available.